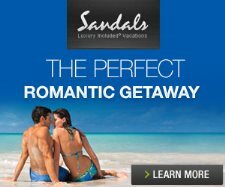 Sandals Negril is set along one of the finest stretches of Negril's Seven Mile Beach. Rated among best beaches within all of the Sandals Resorts. The surf tends to be very mild and the beach faces westward providing some of the most picturesque sunsets within the Caribbean. The beach is lined with palms providing ample shade. Looking down the beach towards the south.